Christi and Jeff occasionally return to the U.S. and are available to visit congregations. Email them to extend an invitation to visit your congregation or organization. Christi works in four French-speaking African countries — Congo, Madagascar, Niger and Rwanda — and the non-French-speaking country of South Sudan. She accompanies global partners as they seek to remedy the marginalization of women and children in their communities, and she engages with Presbyterian constituencies in the U.S. that wish to come alongside and promote those efforts. In the Congolese village of Zapo-Zapo, parents proudly send their children to a new Presbyterian school complex that was built thanks to joint Presbyterian efforts brought together with the help of Jeff Boyd. 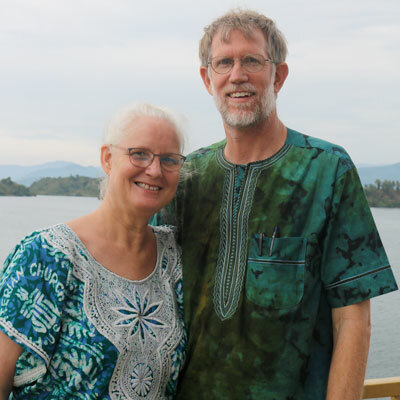 A new Presbyterian education initiative in Congo began when Jeff connected the national leadership of the Presbyterian Community in Congo (CPC) with a couple from First Presbyterian Church in Evanston, Illinois, who were doing volunteer mission work in Congo. The couple facilitated a participatory process for the Congolese partners to identify and strategize around priority areas for its educational ministries. Presbyterian churches across the United States soon joined in to support the resulting Congo Education Excellence Program, which rallies to ensure quality education for Congo’s future generations. The Congo Education Excellence Program is a major focus of the Congo Mission Network. Christi fosters relationships that are aimed at helping women like Julienne, a Presbyterian evangelist from the West-Kasai Province in Congo. After the death of her husband, Julienne found compassion and solidarity in the CPC Department for Women and Families. Following traditional widowhood rites, her in-laws had dispossessed Julienne of her home, her farm and her children. With support from the Presbyterian Women’s Thank Offering, the CPC is offering hope in such times of mourning and striving to curb harmful cultural practices. The CPC wants legal recognition for traditional marriages and official registration of childbirths. Across the African continent, the well-being of women and children is compromised — and authentic Christian witness undermined — by customs that send people into poverty and deprive them of their rightful opportunities. Christi helps bring together U.S. Presbyterians and African partners to maximize their collective mission impact. 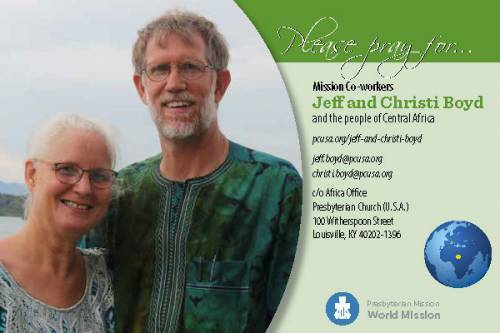 As regional liaison for Central Africa, Jeff Boyd facilitates support for the relationships, programs and activities of Presbyterian Church (U.S.A.) partners in the Democratic Republic of the Congo, Cameroon, and Equatorial Guinea. He also resources PC(USA) mission personnel and helps connect partner churches with PC(USA) congregations that want to be involved in ministry in the region. Most of the countries where Christi and Jeff work are rich in natural resources, but only a small and powerful segment of the population benefits from the revenues they produce. In fact, poverty is rampant, educational access is limited, and disease is widespread. The wealth created by the abundant natural resources often fuels regional conflicts that exacerbate the vulnerability of women and children to cultural and gender-based violence. The PC(USA) works with partners in all seven countries to address these challenges. Congo, Cameroon, Rwanda, South Sudan and Madagascar have large and growing Presbyterian/Reformed churches. The Reformed presence is much smaller in Equatorial Guinea, which is predominately Roman Catholic, and Niger, which is mostly Muslim. Though trained as a physical therapist, Christi has longstanding experience bringing people together to address root causes of hunger and poverty. Having completed 13 years as facilitator for the Joining Hands Initiative in Cameroon, she has particular expertise in building bridges of solidarity that connect people to tackle problems of a globalizing world. Christi earned her physical therapy degree from Academie voor Fysiotherapie in The Netherlands, the country of her birth. Jeff, a native of California, holds a bachelor’s degree from Whitworth College and a master’s degree from California State University. Christi and Jeff are members of Crescent Hill Presbyterian Church in Louisville, KY, and are the parents of three grown children, Matthias, Salome and Naomi.